As a teenager, Tony Gianunzio dreamed of pitching at Wrigley Field, propelling the Chicago Cubs to a World Series title and breaking a long championship drought … at the time, more than 30 whole years. World affairs had other ideas: A few months after drawing some attention during a Cubs tryout camp in 1942, Gianunzio would be in the Coast Guard, eventually headed into service in the Pacific as a gunner’s mate aboard the patrol frigate Machias. Seventy years later, he got at least a little of it back. 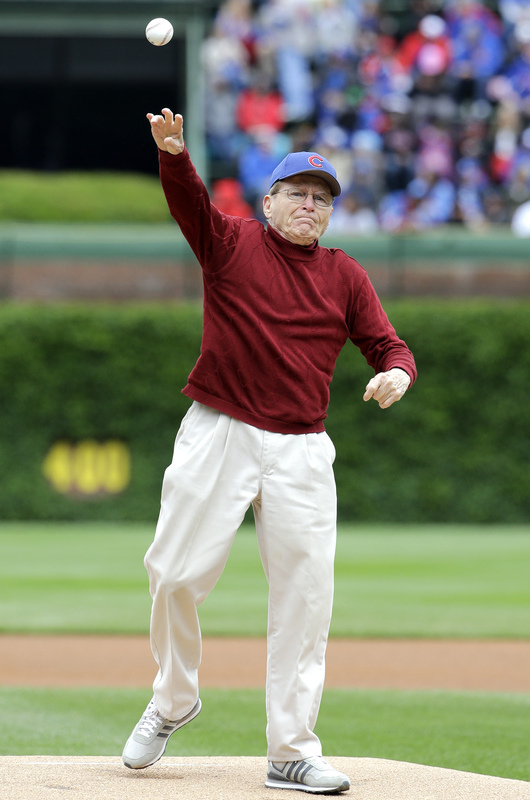 Gianunzio, 92, threw out the ceremonial first pitch before Sunday’s Cubs-Kansas City Royals game — the team still in Wrigley Field, the World Series trophy case still empty since 1908. Only the names have changed: Relief pitcher Justin Grimm (born 1988) served as catcher for the pre-game ceremonies; a young Gianunzio had dreamed of getting signals from Gabby Hartnett (born 1900, retired 1941). Gianunzio taught English and writing to high schoolers for four decades after leaving service, AP reported, and hadn’t thrown a baseball in 45 years before a few practice sessions leading up to his Wrigley Field debut. The Cubs brought him in after being contacted by a Michigan film school, where Gianunzio is the subject of a documentary project. His effort reportedly outshined that of famous actor, troop-supporter and occasional cartoon mob boss Joe Mantegna, who also threw out a first pitch that was both short and wide of the plate. The Cubs won, 2-1, perhaps thanks in part to some karma: Grimm pitched 1 1/3 perfect innings, striking out three.